Asbestos was initially used extensively during the 1930s as a construction material. Unfortunately, the shocking health risks were not identified early enough. We now know that the fibres from this material lead to fatal respiratory diseases and lung cancer. But there’s no need to panic yet! The material is not harmful as long as it’s in good condition. The potential danger only occurs when it has been broken, damaged or allowed to deteriorate. This is what triggers harmful airborne fibres to be released into the environment. The key to staying safe with asbestos is correct identification, care and attention. Chrysotile (white asbestos) is commonly used in buildings, homes and garages. You can identify it by the grey/white colouring and strong yet flexible structure. Amosite (brown asbestos) is also used in buildings, usually as thermal insulation. Crocidolite (blue asbestos) is rare and usually only found in Southern Africa. It resembles textile materials and used for high temperate applications. If your home was built before 2000 and you are concerned about asbestos, have a trusted asbestos surveyor come to check your house. Must Asbestos Always Be Removed? may be more cost effective to leave it in place. Many homes have a significant amount of asbestos within the construction, yet there is no need to tear down the entire house. If your asbestos is in good health and unlikely to be accidentally damaged, it poses little risk. Remember it’s only when the material is disturbed or broken that the hazardous dust is released. Due to the severity of associated health risks, it should definitely be removed if located in more risky areas. You do not have to wait for signs of deterioration before considering complete removal. Absolutely not, asbestos removal far from DIY friendly. Some do remove it themselves then burn/bury the material, but this is very ill-advised. Not only is this against the law but also incredibly dangerous. Harmful fibres will almost certainly be released, posing serious dangers to anyone in the area. Only competent professionals with full safety gear should be undertaking this job. It’s not wise to put yourself and others at significant risk to cut costs. You can learn more about the legal aspects from the government’s official asbestos legislations. First you need a professional surveyor to accurately assess presence, quantity and risks. This stage is mandatory and prepares you for the following stages. An extensive survey is recommended to provide detailed information and safely choose option 1 or 2. If your extensive survey highlights encapsulation as an option you may choose this. It works by applying a protective adhesive to all asbestos material, preventing the release of harmful dust. If encapsulation is not a viable option you will need to consider full asbestos removal, performed by licensed professionals. You can get quotes from qualified tradesmen by filling in the form on the sidebar. The cost of asbestos removal is far greater than encapsulation, but it is well worth the investment. With the threat removed you will not have to be careful or mind hazardous material. Your house will be safer and it can also increase the value. Variables that affect the costs to remove asbestos include location, scale of the project and required resources. Increase your budget if areas are more difficult to access. When the asbestos material has been removed it may have left large areas that need re-boarding, finishing and possibly decorating. Smaller areas can cost less than £1000 in total. For example, a domestic water tank can be removed and disposed of for £200. For larger areas such as an asbestos garage removal, the costs can travel up to £2500+. You may be alarmed at these expenses, but remember it is a worthwhile health investment. If you plan on staying in your home long-term and raising a family, you can’t put a price on their health. 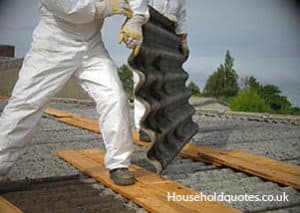 How Much to Remove Asbestos Garage Sections? – The cost of removing an asbestos garage roof starts at £380 or £680 if including sides. – The cost of removing a double garage roof starts from £750 or £1800 if including sides. – The cost of removing asbestos garage insulation ceiling boards starts at £1350. Essex County Council – will remove up to 40kg of asbestos cement for free. Bedford Council – have a reduced rate service for removing asbestos: Eight sheets for £206, twelve for £260 and sixteen for £300. York Council – offer a greatly reduced rate for removing asbestos cement, roofing, pipes and gutters. In most cases up to 200kg of asbestos can be removed for £95. The high cost of asbestos removal may tempt you to skip an extensive survey, or worse yet take on this dangerous job yourself. This is extremely dangerous. Hiring cheap non-qualified workers is not a smart move either. This poses a huge risk to your family, friends and any who visit your home. If you suspect you have asbestos in your home, contact your local council for guidance then hire a certified asbestos surveyor. Fill the form in on the right. This is great advice, thank you for this information. Thank you for such clear information and advice. I will definitely call the council as a first choice. Very Useful as I’m considering buying a house with a garage that’s possibly got an asbestos roof, I will be consulting with local council before I buy. A great guide for those who need the advice but not a sales pitch. Government should take responsibility for the asbestos removal and cover all the costs. They allowed to use it as building materials knowing that it might be harmful. Local councils used it in their houses and now charging for disposing. Very helpful advice. The cost of all this removal will influence whether I continue with my house purchase.